Grief, which is also known as bereavement, is a term used to describe the intense and painful emotions experienced when someone or something a person cares about either dies or is lost. The emotional pain from losing a loved one, whether it is a spouse, child, parent, sibling, friend, or pet, can be the most severe suffering a person must endure. At its most intense, grief can dominate every facet of a person's life, making the carrying out of ordinary responsibilities impossible. Loss and subsequent grief, however, are an inevitable part of life and loving other people or companion animals. Painful as it is, grief is a normal response to loss and generally resolves with the passage of time. Grief is usually characterized by numbness, tearfulness, physical feelings of emptiness in the pit of the stomach, weak knees, shortness of breath, a tendency to sigh deeply, a sense of unreality, and overall emotional distress. Anxiety and longing may alternate with depression and despair. Insomnia and loss of appetite are common. Initially, people often feel numb and unable to accept their loss. Numbness is followed by shock as reality begins to penetrate. There is generally a disorganization of normal behavior patterns that may make it impossible for a bereaved person to return to work immediately or take social initiatives. Such acute symptoms usually begin to subside after several months, with emotional balance being regained within a year. Studies using instruments developed to measure symptoms of grief and bereavement demonstrate wide individual variations in specific symptoms and their intensity. Long after the immediate period of mourning, bereaved persons may continue to feel upset, empty, or tearful. In addition, further losses, additional stressors, or dates of such important anniversaries as a wedding, birthday, or the date of death can reactivate the acute symptoms of grief. Grief and mourning are important life experiences in that they permit a bereaved person to accept the reality of loss and begin to find ways of filling the resultant emptiness. Loss is a significant part of the aging process and can contribute to emotional problems in older people. The impact of loss and resulting grief and mourning is not limited to the death of a loved one. It is also present to a lesser extent in the loss of physical acuity and agility and the loss of social of status as a result of retirement and/or growing older. 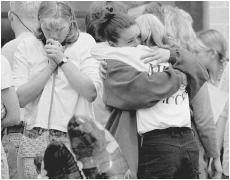 Columbine High School students in Littleton, Colorado grieving for their lost classmates. there is often subtle but insistent pressure on Americans— particularly males— to stop crying and move forward with resumption of regular activities. Onlookers may try to divert the mourner's attention to other topics or discourage crying or talking about the loved one. These responses suggest that grief isn't healthy or that it should be minimized or avoided. If the grief is associated with the loss of a pet, the person may be shamed for grieving because "it was just an animal." Women who have had a pregnancy ended by miscarriage also encounter responses that minimize or trivialize the loss of their expected child. Social insensitivity may drive the mourner to grieve in secret or feel guilty because of continued intense feelings of loss. Shock/denial. This stage comprises the initial period after receiving news of the loss. The affected person may say, "There must be a mistake," "This can't be true," or similar expressions of disbelief. People often describe feeling numb or cold in this stage. Bargaining. This stage represents an attempt to persuade God or a higher power to change the reality of loss in exchange for improved behavior or some sacrifice on the part of the bereaved person. The mourner may offer, for example, to take better care of their relationship with the loved one if God will only bring them back. Anger. This emotion may be directed toward the medical establishment, family members, God, or even the person who has died. Depression. In this stage, the person's body begins to absorb the reality of the loss. The bereaved person may be unable to eat, sleep, or talk normally with people. They may have episodes of spontaneous crying and such physical symptoms as nausea, headaches, chills or trembling. Acceptance. This is the phase in which the mourner comes to terms with the loss and begins to look ahead once more. Energy returns and the bereaved person is able to reconnect with others, engage in enjoyable activities, and make plans for the future. There is, however, no "normal" pattern for grief; it is a highly variable experience. People pass through the stages outlined by Kubler-Ross at their own rate, depending on the significance of the loss, number of previous losses, individual resiliency, presence of a support system, and permission to grieve from those around them. Grieving is not a linear process. There is movement back and forth between the stages until acceptance is reached. Occasionally, a person may remain "stuck" in one stage, particularly anger or depression, and may benefit from professional help in order to move on. Remaining in one of the stages indefinitely can create emotional and occupational difficulties. Studies show that some widowed people have hallucinations or delusions of contact with the lost spouse that may last for years. These hallucinations are more likely to occur in people who were happily married. The most common hallucination reported is a sense of the dead spouse's presence. Others report seeing, hearing, or being touched by or spoken to by the spouse. The interplay of grief and marital quality has led to research findings that contradict earlier widespread beliefs. A study by Deborah Carr and her colleagues in 2000 found that anxiety was greater in those who had been highly dependent on their spouses than in those who were less dependent. People who had been in conflicted relationships reported lower levels of yearning for the spouse than those who had enjoyed high levels of marital closeness. Women who had relied on their husbands to do the driving and perform other similar tasks had much higher levels of yearning than men who depended on their wives. This finding contradicts the common belief that grief is more severe if the marriage was conflicted, suggesting a more complex relationship between bereavement and characteristics of the marriage. Another suggestion of the complex relationship between bereavement and marriage is reflected in studies of sudden and anticipated loss among older widowed people. The sudden death of a spouse was associated with slightly higher levels of yearning among women, but significantly lower yearning among men. Forewarning of the death (extended illness, advancing age) did not affect depression, anger, shock or overall grief six or 18 months after the loss. Prolonged forewarning was associated with increased anxiety at sixand 18-month follow-up interviews after the death. Grief and mourning may also occur when the loss of a partner occurs through divorce or the end of a dating relationship. Some researchers think that moving to the stage of acceptance is more difficult in such cases because the partner can still be contacted, especially if there are children involved. Seeing a former partner involved in a new relationship can cause the partner mourning the loss to re-experience acute symptoms of grief. Some research evidence suggests that grief related to the breakup of an intimate relationship is more intense for the individual who was left behind than for the person who ended the relationship. Grieving may be particularly prolonged and intense when certain unexpected losses occur that are outside the ordinary progression of life events. The loss of a parent before a child reaches adulthood or a parent's loss of a child inflict deep emotional wounds for an extended period of time. Similarly, the loss of a loved one to murder, terrorism, or other acts of intentional violence is harder to bear than death resulting from natural causes or accidents. Death from suicide complicates grief by adding shame to the other painful emotions associated with bereavement. The opportunity to fully grieve such significant losses, however, enables survivors to move forward despite the magnitude of their loss. Butler, Robert N., Myrna I. Lewis and Trey Sunderland. Aging and Mental Health. 5th edition. Boston: Allyn and Bacon, 1998. Harris, Maxine, Ph.D. The Loss That Is Forever: The Lifelong Impact of the Early Death of a Mother or Father. New York: Dutton, 1995. Kubler-Ross, Elizabeth, and David Kessler. Life Lessons. New York: Simon and Schuster and the Elizabeth Kubler-Ross Family Partnership, Ltd. 2000. Vaughan, Diane, Ph.D. Uncoupling: Turning Points in Intimate Relationships. New York: Oxford University Press, 1986. Carr, Deborah, James S. House, Ronald C. Kessler, Randolph M. Nesse, John Sonnega and Camille Wortman. "Marital Quality and Psychological Adjustment to Widowhood Among Older Adults." Journals of Gerontology Series B: Psychological Sciences and Social Sciences 55 (2000): S197-S207. Carr, Deborah, James S. House, Camille Wortman, Randolph Nesse and Ronald C. Kessler. "Psychological Adjustment to Sudden and Anticipated Spousal Loss Among Older Widowed Persons." Journals of Gerontology Series B: Psychological Sciences and Social Sciences 56 (2001): S237-S248. Zisook, S., R. A. Devaul, and M. A. Click Jr. "Measuring Symptoms of Grief and Bereavement." American Journal of Psychiatry 139 (1982): 1590-1593. The Compassionate Friends, Inc. P.O. Box 3696, Oak Brook, IL 60522. <http://wwwcompassionatefriends.org> . GROWW [Grief Recovery Online (founded by) Widows & Widowers]. 931 N. State Road 434, Suite 1201-358, Altamonte Springs, FL 32714. <http://www.groww.org> .